"This side don't play, but be on the lookout for the album, whobody sees, nobody knows due out when it is done!!! Special thanks to Jerry The Cat, Jazzhead & Mr. Marsellus on this piece." Track duration and BPM are not provided on the record. Hands down, my favourite track of Theo Parrish. And I am a big fan of Theo's music in general. 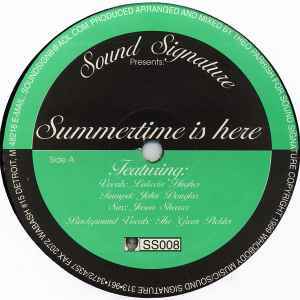 What I find strange is that others do not find "Summer time is here" to be anything special - one of the few older Theo's records which you can still buy at a cheap price. But you should not be misled by this at all. It's beautiful, beautiful music. Very soft, kind of nostalgic and melancholic - to me, Theo at his best. this is a DIAMOND. for ever and ever.